Critics regularly trot out statistics in support of arguments that under PM Najib, Malaysia's national debt has ballooned, the ringgit has collapsed and runaway inflation has eaten into the meagre earnings of the nation's poor. Some observers have even spoken of an impending "crisis". But are all these things really true? And, if so, can the blame be laid squarely at the feet of the current prime minister? Sadly, emotions are running so high on both sides of the political divide that genuine attempts at formulating an objective assessment are in danger of being ignored. As I argue in my new book, Economic Reform In Malaysia: The Contribution Of Najibnomics (published last month in Malaysia by Pelanduk Publications), which forms the basis of this article, the picture is not so dire. Take that controversy about the national debt. According to the Economic Report of the Ministry of Finance 2016/2017, federal government debt stood at RM655.7 billion (S$208 billion) at end-June 2016, an amount equal to 53.2 per cent of the GDP. It sounds worrying, particularly since the comparative figure when Datuk Seri Najib became finance minister in late 2008 was a more comfortable 41 per cent. A closer look, however, shows that almost all of the increase took place in a single year. In 2009, governments everywhere were pumping huge sums into their respective economies in response to the global financial crisis. Malaysia did the same thing. The result was that debt as a percentage of GDP surged to 52.8 per cent. But since then, the proportion has remained fairly steady, rising in some years and falling in others. So there is no pattern of persistently reckless or profligate spending. Moreover, a large proportion of the debt is denominated in ringgit, rather than a currency such as the US dollar. This means that any sharp fall in the value of the ringgit (or any other scenario that involves the cessation of capital inflows into Malaysia) is very unlikely to prompt a debt crisis. It is also worth pointing out that the current debt level is not unprecedented. In 1990, for example, Malaysia's debt-to- GDP ratio was almost 80 per cent. That said, the troubles facing several major government-linked corporations are difficult to ignore. In January last year, it was reported that 1MDB had debts totalling at least RM50 billion, compared with assets of RM53 billion. Meanwhile, FGV's decision last month to put on hold the issuance of RM1.5 billion of Islamic debt paper designed to refinance some of its enormous debts has refocused attention on the need for key appointments to be made as quickly as possible in the wake of recent resignations. So far, however, international credit-rating agencies seem to be taking the situation calmly. In April, when 1MDB did not pay a US$50.3 million coupon on a US$1.75 billion bond following a dispute with Abu Dhabi sovereign fund IPIC, rating agency Fitch issued a statement saying it did not expect the situation to have an immediate negative impact on Malaysia's sovereign ratings. Standard & Poors seems to have adopted a similar wait-and-see approach. In June, the agency said that, while it was watching the situation carefully, the current outlook remained "stable". The macroeconomic impact of any future sovereign downgrade should also be seen in context. Since domestic institutional funds have ample liquidity, any sell-off in the country's bond or equity markets would likely be limited. It is true that the ringgit has weakened in recent years. But this has more likely been due to foreign rather than domestic factors. Chief among these was the dramatic fall in international oil prices and a drop in demand for Malaysia's commodity exports. By comparison, the impact of the political uncertainties brought about by various political controversies is likely to have been minor. Those who contend that the weak ringgit reflects foreigners' low confidence in Mr Najib's Malaysia have to explain why the stock market has not collapsed and why international institutions such as the International Monetary Fund and World Bank have consistently published positive assessments of the Malaysian economy. It is also important to remember that a weak ringgit is not all bad. It makes Malaysia's exports cheaper and provides foreign direct investors with an opportunity to establish a presence in the country of minimal cost should they choose to do so. Much has also been made of the impact of Mr Najib's economic policies on the poor, particularly when it comes to the abolition of subsidies and the introduction of the controversial goods and services tax (GST). But, in fact, when Mr Najib took over the nation's top job in 2009, government subsidies had already become unsustainable. These subsidies had to be removed despite their inflationary implications. To fail to do so would be to place the country on a perilous course. There would be little money left for spending on health and education - both vital issues for the poor - not to mention the sort of infrastructure necessary to ensure future economic growth, and therefore jobs. The government has tried to alleviate the impact of these economic reforms on the poor by introducing programmes such as the 1Malaysia People's Aid. Of course, such handouts are not a permanent solution. For that, strong and balanced economic growth is needed. But growth can come only if leaders are willing to take the unpopular measures necessary to reform the economy. As for the GST, this was necessary in order to force the middle class to share the tax burden. Tax avoidance in Malaysia is a serious problem. Only one in 10 people actually pays income tax. This is significantly lower than in many other middle-income countries, and far lower than in the high-income economies Malaysia says it wants to emulate. While the GST is generally regarded as a retrogressive tax as it taxes the rich and the poor alike, its impact on the poor has been minimised by ensuring that many common food items such as rice, fresh fruit, bread, meat and vegetables are GST-exempt. Annual price rises, as measured by the consumer price index (CPI), have breached the 3 per cent level only twice since Mr Najib took power. The political problem arises from the fact that the food and beverage component of the CPI has often risen much faster. Soon after becoming prime minister, Mr Najib launched a determined campaign to reform the Malaysian bureaucracy by introducing key performance indicators (KPIs). Annual achievement levels on these measurable KPIs, verified independently by Pricewaterhouse Coopers (with the methodology scrutinised by a panel of international experts), have been published every year since 2011. But while the government launched this major administrative reform effort, the likes of which has not been seen since the days of Prime Minister Abdul Razak Hussein, the attention of the Malaysian public has been focused on quite different things. Observers may react to recent corporate scandals with horror, but they should beware allowing this visceral reaction to colour their judgment of other aspects of Malaysia's economic performance. In May 2015, the Malay Mail newspaper published the results of a quick survey showing that Malaysians were generally unaware of these KPIs or the key focus areas of the 11th Malaysia Plan. Most respondents had also not watched Mr Najib's televised speech on the subject three days before. The danger is that such disinterest may ultimately condemn the reform effort to the dustbin of history. This is because while properly formulated KPIs can have many advantages, poorly formulated ones can inadvertently produce all manner of dysfunctional behaviour. Public feedback is vital. Are current KPIs well formulated? Are ministers sufficiently fearful of political opprobrium should they fail to perform? Malaysians are simply not asking such questions. 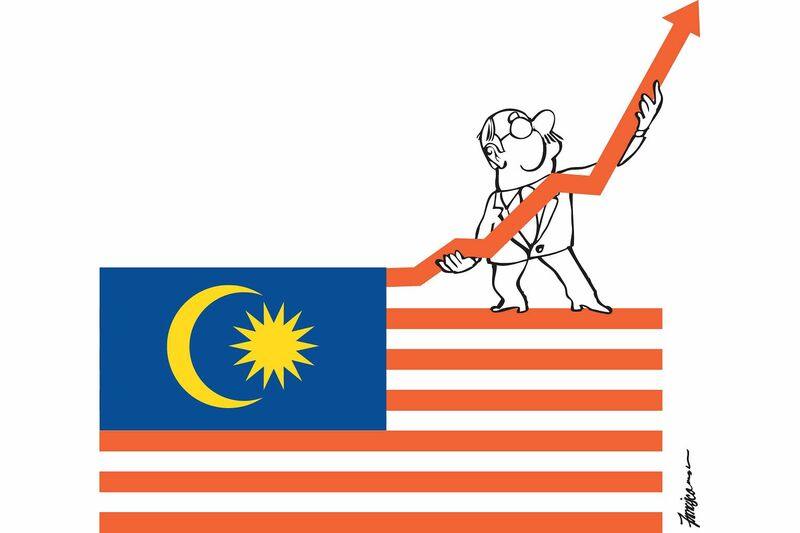 Of course, the Malaysian economy is still beset with some serious systemic weaknesses. Among these are low labour productivity, a lack of affordable housing and high household debt. But even here, there are positive points to be made. For example, while developed countries have much higher productivity levels, the productivity of Malaysian workers is improving at a faster pace. As for household debt, it is only fair to point out that at the aggregate level, household assets have been consistently maintained at more than twice this level. In other words, Malaysian households are comfortably net positive in assets. Meanwhile, the Malaysian economy has continued to grow at a rate well above the international average. The economy expanded by 5.8 per cent in the second quarter of this year compared with the same period last year, the current account surplus widened, and investments rose by 7.4 per cent. Latest figures also show that inflation is well under control, with the CPI registering a rise of just 3.2 per cent in July. The wider point to be made, however, is that Mr Najib has simply not been given due credit. The reality is that under his leadership, Malaysia's macroeconomic policies have been broadly appropriate. Abolishing the subsidies and implementing the GST were both necessary and urgent. The same may also be said about Malaysia's participation in the Trans-Pacific Partnership negotiations, which the United States has pulled out of. The fact that these unpopular policies were pursued in the wake of two national elections (in 2008 and 2013) that resulted in a strengthened opposition also suggests a degree of political courage rarely found among Malaysian leaders. A former partner at the Hong Kong-based Political and Economic Risk Consultancy and, later, a senior writer with The Straits Times, Dr Bruce Gale currently provides independent research, analysis and editorial services to the private sector.